Since day one, Pinterest isn’t my cup of tea. I didn’t have the minds of a designer and definitely not artistic. Participating in Pinterest as a social media marketing strategy just spells more risk and challenges than I could ever imagine. But I was proved wrong with the stats taken from Google Analytics. Aside from Twitter and Facebook, Pinterest is sitting at the top 3 social referral traffic for me since I started my blog, SuccessGround.com. And that, got me thinking real hard. What did I do to get such amount of traffic? Let’s break them down in this post, shall we? You heard about the best time to tweet, publish a Facebook update and even the best time to pin an image. Well, here’s the fact: Time doesn’t play a role (not much). According to Kevan from Buffer, images uploaded to Pinterest has a longer shelf life. This means that you don’t really have to decide what is the best time to upload an image. Make sense, if you ask me. We are all attracted to images (well, most of us) and what we do is to scroll down until we hit a nice image to share. We don’t check the top 5 images only like we do with Twitter timeline. What I did? I publish images during the day time based on the timezone of my potential readers. Yup, just that and really, no science behind that. Do you leverage the description column of the pin? Or … do you actually just do this, “#This #is #an #image #about #socialmedia #marketing”? Pinterest isn’t just about hashtags (but Twitter and Instagram do). Sure, an image represents a thousand words but you can’t be making your followers playing the guessing game for every image you uploaded! Be descriptive and creative with your description. You can always add several hashtags at the end of the description. My personal trick that works all the time is to create really powerful call to action to ensure that it integrates readers to click further and read. Basically, go with a descriptive (but short) description and followed by the link plus some hashtags. In most social media platforms, more followers would represent brand power and the same goes to Pinterest. However, having more followers isn’t a requirement on Pinterest. 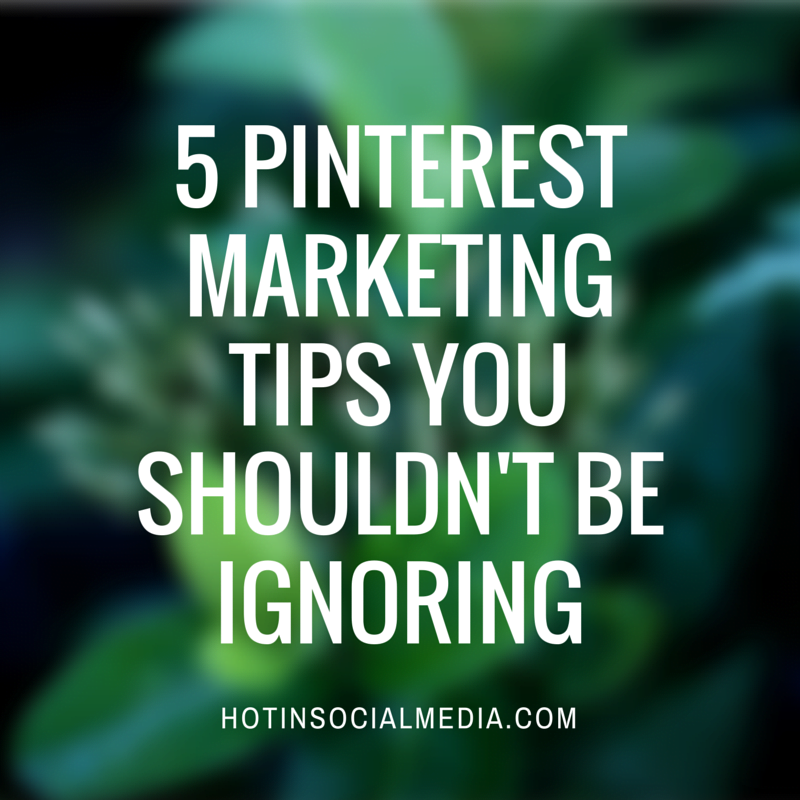 It is advisable to have bigger following but it is definitely not a necessary for Pinterest marketing. You know what matters most? I would say Pinterest is rather unique. Your pinned images need to be in as many boards as possible and that would guarantee you more viewers (and chance of clicking). Now, bear in mind that the above are exactly similar for your readers. If Pinterest marketing is your thing, then you need to focus on using the right image size. Let’s go into detail, shall we? One of the biggest makes done by many (including me) is to pin every image I could find on the blog page. After all, the concept of more images would provide more visibility, right? Not really — in this case. As the points above, having more less-optimized images would be shown lesser on news feed and this would just be a waste of time. Plus, this is not going to bring you anywhere closer to your social marketing goals. Use the right image size every time you are publishing to Pinterest. If you need help, there are tools like Canva and PicMonkey which does a great job for you. In a recent talk with a friend, I was advised that Pinterest is all about engaging and we should engage it just like how we do it with Facebook and Twitter. Frankly, I bet to defer. I also love the point that Buffer brought up, “Pinterest is more like Pocket or an Evernote”. In my personal point of view, that makes a lot of sense. Imagine the power to create different boards based on specific interest. I could have one board for online marketing, another for native advertising and a few more based on blogging tips, social media and even my own fun board! Of course, being more interactive on Pinterest can bring you more followers and clicks, but remember that those will bring you just that far in Pinterest marketing. Pinterest is pretty much future-focused. With this article, let’s us conclude that optimal timing which we have been talking about for months, is slightly off. Instead, more focus should be in placed for optimizing images, creating great call to actions within the description box and most importantly, making each image shareable directly from your blog. So, before you head over to the next post, I want to hear your thoughts on the key strategies for Pinterest marketing (that keep working well for you).